Following the success of previous years, GKB Machines have taken a larger stand in one of the new halls at this year’s BTME to display more of their machinery range. 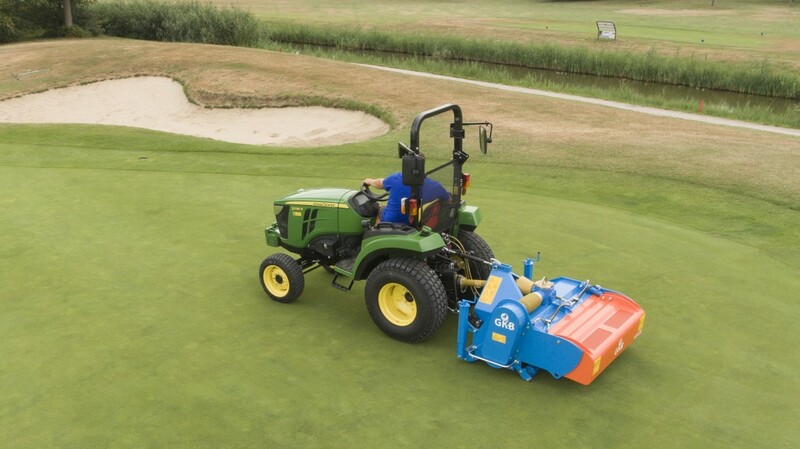 The new Topair 120 being introduced at the show is based on the popular Topair 160 model, offering a smaller machine for use on the golf course with compact tractors. 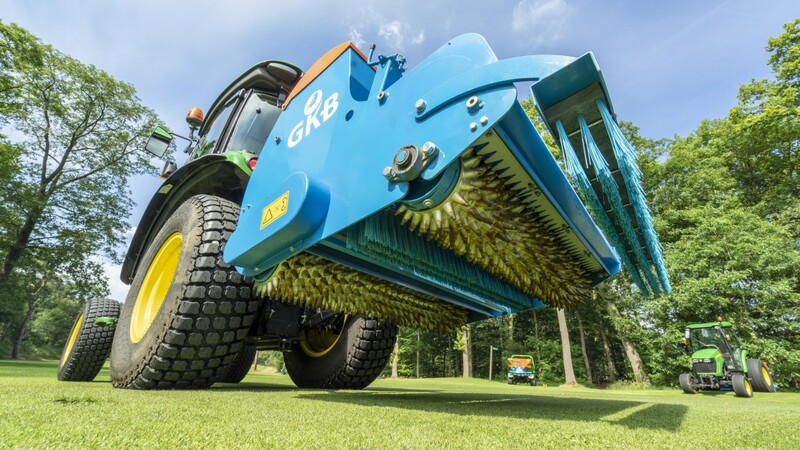 A robust and reliable combined aerator/roller its GKB developed Evolvente® blades minimise upper layer disturbance to leave a smooth, levelled finish when used in conjunction with the water-filled roller. The two operations can also be done separately. The machine features optional cutting discs to leave a continuous slit to aid surface water drainage and the slicing of grubs. 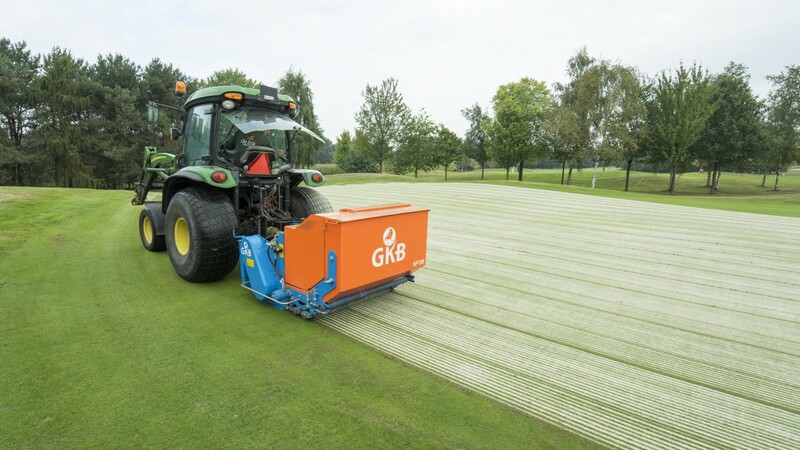 In areas on the golf course where surface water and moss formation are a problem, the GKB Sandfiller goes to work offering a fast solution for drainage and intensive aeration. Top layer treatment is environmentally friendly and cost-effective with its all-in-one combination of aeration and sand filling. Intensive aeration of the grass leads to quicker recovery, greater green longevity and faster drainage of surface water, without the need for complete renovation. Meeting top dressing requirements for golf courses and all types of sports pitch the GKB SP100 Spreader has been developed on the back of the success of GKB’s trailed versions and to meet customer needs with easy mounting onto turf trucks, such as the John Deere Gator and Toro Workman. Mounting is straightforward with a simple bolt-on system and stand legs allow the SP100 to be quickly set up or removed. With its 1m3 hopper capacity the machine suits a variety of purposes, evenly distributing materials, such as sand and mulch, with variable spread widths and depths. It’s easily fitted with electro-hydraulic controls and runs directly off the hydraulics of the chosen turf truck. The GKB Combiseeder offers a fast, efficient way of seeding and surface aerating with virtually no surface disturbance. Creating over 1500 holes per m² the Combiseeder provides accurate seed application at various rates to suit different seed mixes, with drag brushes to incorporate seed and topdressing. The Combiseeder can be used for overseeding and initial seeding and features two spiked rollers that open up the soil for the seed to then be spread accurately across the full width, in and around the holes. Two drag brushes incorporate the seed into the holes and this method results in minimal surface disruption. The latest GKB Vstrong improves on already proven technology to offer the professional a robust and reliable scarifying machine that swiftly deals with the problem with the minimum waste flow. Operating speeds up to 7.4mph/12km/h mean you can quickly cover a lot of ground for maximum productivity. At the heart of the Vstrong is the CombiRotor with generically developed 3mm carbide scarifying blades. The blades, in turn, are attached to the rotor by means of the QuickLock system which allows you to attain a depth of 5cm. In combination with the reversed rotation direction you’re guaranteed you don’t miss an inch. There is also the option of 2mm or 4mm blades and you can alter the centre-to-centre distance of the scarifying blades. For added benefit a collection system can be used to catch the dispatched material. GKB Machines at BTME Hall:Purple: Stand: 406. To find out more visit www.gkbmachines.com or call 07495 883617.